uses a solid mixture of fuel and oxidizer for a propellant. Since it has no moving parts, it is very reliable. However, once a solid rocket is ignited it cannot be shut down until all the propellant has been burned. uses separate liquid fuel and oxidizer, which are combined only at the moment of combustion. Pumps are required to get the fuel & oxidizer to the motor quickly enough to develop desired thrust. This makes liquid fuel rockets more complicated, however liquid fuel is up to twice as powerful as solid. Also, liquid fuel rockets can be turned off and then turned on again. On the space shuttle, they can be throttled for more or less thrust. 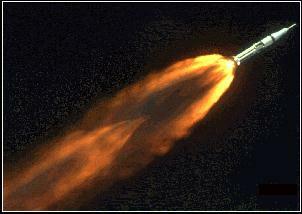 So liquid fuel rockets are not only more powerful, they are more controllable.